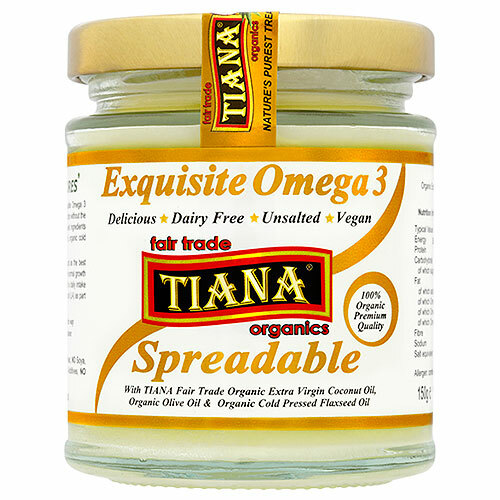 A unique dairy-free alternative to butter made with TIANA Fair Trade Organic Raw Extra Virgin Coconut Oil in a formulation with top quality cold pressed organic olive and flaxseed oils that are natural sources of Omega 3, 6 & 9. With a delicious, butter like taste without any hint of coconut aroma the spread uses top quality cold pressed flaxseed oil that is high in a-linolenic acid - Omega 3. Excellent for sandwiches, on toast or served your favourite way. Great when melted over cooked vegetables, pasta, rice or potatoes. Spreadable at room temperature, above 20°C keep refrigerated. Once opened, use within 6 weeks. 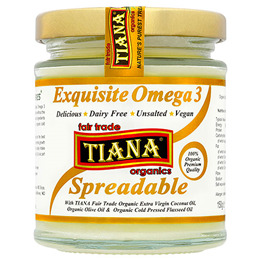 Below are reviews of TIANA Dairy-Alternative Omega 3 Spreadable - 150ml by bodykind customers. If you have tried this product we'd love to hear what you think so please leave a review.